The Council on Ministry to Men (MTM) promotes the ministry of the local church in serving the needs and interests of men in the church and community. The MTM Objectives are to help men understand the Mission of the Church, to fellowship with one another, and broaden our Christian living in our homes, church and community. This helps to provide more talent, manpower, leadership and strengthens the church. 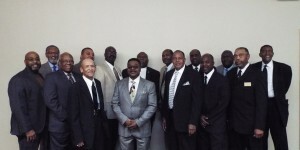 For more information about the Ministry to Men, please contact Bro. MacJeffrey Jackson, Coordinator.